Let us pause for a moment and consider what it means to be an apostle and what is meant by the apostolate. It is necessary to distinguish it clearly from “activism,” occasional actions which are superficially insignificant and lack any kind of internal coherence. The true Christian apostle makes it visible, because he lives in Christ and is immersed in the mystery of Christ in all the circumstances and situations of his life. He witnesses to God. This mission has its foundation in the act of being incorporated with Christ through our baptism and is consolidated in the Holy Spirit through the sacrament of confirmation. This is what Vatican Council II teaches us. Therefore, the degree to which I can radiate Christ to humanity and the world is based on the extent to which I identify myself with Christ and live his life. The great witness of Christ has been the Virgin Mary because while she lived in this world a life similar to others – filled with family concerns and labors – “she was constantly united to her Son and she cooperated in a singular way with the work of the Savior.” She is truly the Queen of the Apostles. Scripture shows her to us as gathered at the Cenacle amid the apostles who persevered united in prayer. An image of the past, but also a reality for all times and which wants to be renewed today. With her ardent and humble prayer, Mary implored the coming of the Spirit on the apostles. She also implores that it comes to us so that we may be transformed more and more into Christ her Son….. that we may become like Him, reproducing in us his image…..that we may become authentic disciples of Christ, that is, men and women filled with the Holy Spirit who live and act as his “agents” or instruments on earth. Thus may the true apostle live detached from himself and addicted to Christ…..that daily the old man may die so that the new man may come forth…..that is, Christ; that the new man may not seek his own personal success but the victory of his Lord; that he always be joyful amid the struggles and trials of life and that in all circumstances he finds himself sheltered in the merciful and faithful love of the Father. In Schoenstatt, the Virgin Mary is “our Foundress, our Lady, our Queen” (Fr. Kentenich 10/18/1939). The consecration, the covenant which we seal with Mary in the Shrine and which we strive to put into practice in our daily life, is a guarantee of an always renewed apostolic motivation. And thus it should be. Every true encounter with Mary should lead us more deeply to Christ, to help us identify with Him and to also share His redemptive mission. 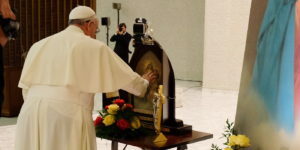 “Mother Thrice Admirable, teach us your enemies bravely to face…..So that the world through you made new pay to your Son His homage due,” reads one of the first prayers in the tradition of the Schoenstatt Family. Apostolic fruitfulness, Schoenstatt, a movement with a deep spirituality which motivates its members to personal sanctification. But, “this sanctification leads to the apostolate and is nourished by it and sets one on fire with apostolic zeal for souls.” “We do not know of any apostolate without an inner self and no inner self without an apostolate.” (Fr. Kentenich). Mary, the great Missionary, wants to motivate us to action, to apostolic work…..in our own environment…..in my family…..at my place of employment…..at school or the university…..in my social circle…..in my parish or in the diocese. Enthrone the image of Mary in your home, erecting there a “Home Shrine.” Teach others to pray the Holy Rosary. Go on pilgrimage and foster pilgrimages to Marian Shrines. Celebrate the feast days of the Virgin Mary. Live the “Month of Mary.” Spread the praying of the Angelus. Encourage the reading of Marian literature. Marian apostolate…..we want to make known the special presence of the Virgin Mary in her Schoenstatt Shrine. Father Kentenich expresses it thus in a prayer: We shall proclaim your name courageously and lead all men to your Shrine. We shall proclaim your name. That is, we shall also announce the Blessed Virgin Mary as Mother Thrice Admirable, Queen and Victress of Schoenstatt. We shall give witness to the graces which she has bestowed from there. We shall make known the life of the priestly instrument which she chose to manifest herself from this place. “And we shall lead men and women to your Shrine.” At times I will take a person who has a problem and who needs to be at peace. At other times I will invite a family…..or a school group…..or a parish…..or an institute…..or an apostolic movement. Whoever arrives at the Shrine with an open and believing heart will not leave from the Shrine with empty hands. In some way or another, he will become an apostle of the Shrine at some time. In this way, the circle of those who have experienced the glory of Mary in the little Chapel will grow wider and wider.